Engel New is a sans serif typeface created by Sofie Beier and published by The Northern Block Ltd which is a new version of Engel font. It is available in 2 widths (Sans & Serif ) each with 6 weights (from XLight to Bold) and their italics, a wide range of OpenType features and multilingual support. It is ideal for editorial use, display, headline etc. 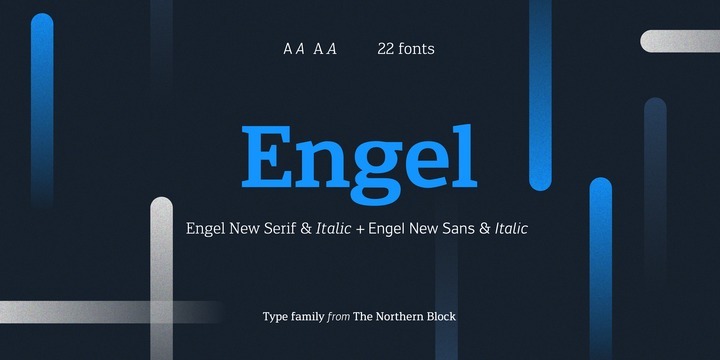 Note: “Engel New” is a trademark of The Northern Block Ltd.
Price: starting from $30,36 for one font to $388,00 for all 24 fonts. A font description published on Saturday, June 17th, 2017 in Fonts, Sofie Beier, The Northern Block by Alexandra that has 3,246 views.